Of the several core Web development environments, including ASP, PHP, and ColdFusion, JSP enjoys the greatest robustness because it's based on the Java language. In addition, newly-introduced tag libraries will even further extend JSP's functionality by making code easy to reuse and maintain. As a result, web developers are increasingly likely to choose JSP as their Web application-programming environment. This book is a guide to the recently introduced Java Tag Extension API, illustrated by real-life case studies. A complete approach to JSP programming is provided, with a discussion of its shortcomings and how these can be addressed by employing tag libraries. It discusses modeling and designing applications based on these technologies, then provide a specific implementation (Jakarta STRUTS). 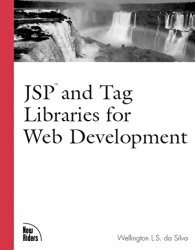 This book goes well beyond other resources on JSP, which contain at most a single chapter on tag libraries. The explanation of tag library technology and examples of its implementation will help bring new capabilities to current JSP programmers. Code samples will be available for download from www.newriders.com.